I ordered a copy of the ASA Instrument Procedure Trainer 7 a few days ago and received it yesterday. The package includes the simulator software and the Pilot’s Manual Volume 3: Instrument Flying. I don’t have enough experience with it to give a detailed review yet but, I can say the installation was very easy and the book is excellent. I did spend some time working on the first lesson last night and the software seems easy to use. Each lesson starts with a demonstration of the task to be performed, a prompted session with the virtual CFI giving instructions, an unprompted practice session and then a test. Each of the demonstration, prompted and practice stages can be repeated as many times as you feel you need. At the end of each, you will get an evaluation of how you did. I will give a more detailed review after I have spent some time using the software but, from what I have seen so far, this program will help me prepare for my flight lessons and, in the long run, save me money. If you would like to try the program for yourself, ASA offers a free demo at http://www.asa2fly.com/IP-Trainer-Demo-C152_category.aspx. How do you like it Rusty? 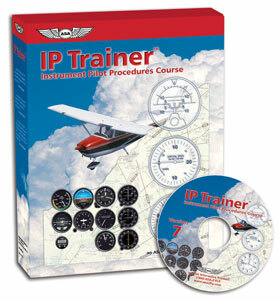 If I’m not mistaken, IP Trainer is for instrument students while On Top is better suited to rated pilots looking to keep their skills sharp. Does that seem right? I considered the IP Trainer/On Top combo package but decided to try one to see how I liked it. I can always add On Top later. These are great tools for getting the basics down. When I was doing my Instrument training, I would spend hours flying these things just to get the basics and develop my scan. One thing I realized at some point was that I would very rarely use the attitude indicator. Depending on what I was trying to accomplish I would scan different instruments some more regularly and others as backups or supporting. Level turn. Altimeter and turn coordinator. I hope the IP Trainer works out well for you and good luck!